The stage is set for another artistic season. Here are some standouts. American artist James McNeill Whistler (1834-1903) was an arrogant, litigious man, but his gorgeous art belied his prickly personality. During his prolific career, he found beauty in muted scenery and turned the ordinary into the extraordinary with his innovative and poetic style. More than 100 lithographs and etchings spanning his career in Europe are on display in the University of Michigan Museum of Art’s exhibit On Beauty and the Everyday: The Prints of James McNeill Whistler. The bulk of the show comes from the bequest of Margaret Watson Parker, an early Whistler collector known for her discernment. Now through Nov. 28. Free ($5 suggested donation). University of Michigan Museum of Art, 525 S. State St., Ann Arbor; 734-764-0395, umma.umich.edu. The World Cup soccer games this summer showed how nations can harmonize through sports. Global cooperation through music takes that spirit a step further. World music is a genre that shows no signs of losing steam, and one of its biggest proponents, Detroit’s own Sean Blackman, will show what the big attraction is when the guitarist joins musicians from Armenia, Senegal, and Brazil — along with dancers and local jazz players — in a show called Sean Blackman’s In Transit, which is also the name of his latest CD. One could say the world is Blackman’s oyster. After the four-continent-wide concert, the journey continues at the Music Box at the Max, outside the hall. 8 p.m. Sept. 24. $18-$100. Orchestra Hall in the Max M. Fisher Music Center, 3711 Woodward, Detroit; 313-576-5111, detroitsymphony.org. Noël Coward’s wit is nothing to sneeze at; just consider his 1924 comedy Hay Fever as evidence. The ironically named Bliss family live in a world that intertwines reality with fiction. There’s Judith, a former actress; David, a writer; and their two grown, imaginative children. When they each invite a romantic guest over, an interesting weekend ensues. The guests highlight the family’s lack of self-awareness before finally being driven to the edge. Coward admitted the play has “no plot at all and remarkably little action. Its general effectiveness therefore depends on expert technique from each and every member of the cast.’’ See the technique of Wayne State’s graduate theater students in action. Oct. 1-Dec. 4. $25-$30. Hilberry Theatre at Wayne State University, 4841 Cass, Detroit; 313-577-2972, hilberry.com. David J. Magidson begins his first full season as artistic director of the Jewish Ensemble Theatre in October with a drama by James Sherman (who has sometimes been compared to Neil Simon): The G-d of Isaac. Like Hamlet, it’s a play within a play; Isaac Adams, a playwright and actor, performs his own piece about discovering the significance of religion in his life. Alternating between light comedy and serious contemplation of culture and identity, The G-d of Isaac focuses on Adams and his quest to discover what being Jewish means. Oct. 6-31. $32-$41. 660 W. Maple Rd., West Bloomfield Township; 248-788-2900, jettheatre.org. Considering the popularity of vampires these days, Meadow Brook should have a bloody good hit on its hands as it puts a modern spin on a timeless story in Dracula: A Rock Opera. Perhaps Bram Stoker wouldn’t have recognized the transformation of his novel, but a vampire musical will no doubt thrill Twilight and True Blood junkies. Sorry, but Taylor Lautner isn’t in the cast. Oct. 6-31. $24-$34. 207 Wilson Hall, Oakland University, Rochester; 248-377-3300, mbtheatre.com. Under Leonard Slatkin’s baton, the season opener is a real ear-opener, with Berlioz’s wildly theatrical Symphonie Fantastique sharing the bill with Bruch’s Violin Concerto No. 1 (with soloist Sarah Chang) and William Schuman’s American Festival Overture. Oct. 8-10. Another intriguing concert in December is a Slatkin family affair. Leonard Slatkin will be on the podium, with younger brother Fred Zlotkin (he retained the family’s original Russian spelling) as soloist in Korngold’s Cello Concerto. But the family connection doesn’t end there. Their cellist mother, Eleanor Aller, performed the work in the 1946 Warner Bros. film Deception. Dec. 9-11. $19-$123. Orchestra Hall in the Max M. Fisher Music Center, 3711 Woodward, Detroit; 313-576-5111, detroitsymphony.org. MOT has a few things to sing about this year. Not only is the company celebrating its 40th season, MOT Director David DiChiera is one of four recipients of the 2010 National Endowment for the Arts’ Opera Honors. He’ll pick up the prestigious award, which recognizes lifetime achievement in American opera, on Oct. 22 at the Kennedy Center in Washington, D.C. Back in Detroit, MOT opens the season with a perennial favorite: Gilbert and Sullivan’s melodious The Mikado. Join Yum-Yum, Ko-Ko, Nanki-Poo, Pitti-Sing, and the rest of the colorful characters Oct. 10-24. $29-$121. Detroit Opera House, 1526 Broadway, Detroit; 313-961-3500, motopera.org. The Purple Rose celebrates its 20th season with the premiere of Jeff Daniels’ 13th piece for the company. But don’t expect it to carry any unlucky associations; Daniels has been on a lucky streak with the theater for two decades. The Chelsea native and actor known for his role in Dumb and Dumber and a plethora of other films and stage productions, keeps the little theater going despite the allures of Hollywood. The first of four world premieres in the Purple Rose’s season will kick off in October, a dramedy set in a small Michigan town. Titled Best of Friends, Daniels brings it home to portray the all-too-familiar scene of married couples exploring their friendship, with comic results. Oct. 14-Dec. 18. $25-$38. Purple Rose Theatre, 137 Park St., Chelsea; 734-433-7782, purplerosetheatre.org. It’s hard to believe that two decades ago this contemporary dance troupe, under artistic director Laurie Eisenhower, made its first leap to the stage. Now marking its 20th season, EDE has gained a foothold on Michigan’s dance scene, but the troupe has also performed in New York City and Russia. The season opener, On the Move, showcases pieces by various choreographers, and includes a work by José Limón performed by guest company the Detroit Dance Collective. 8 p.m. Oct. 23 and 2 p.m. Oct. 24, $9-$17. Varner Recital Hall, on the campus of Oakland University, Rochester; 248-370-3013, ede-dance.org. The Hot Club of Detroit is sizzling, but when the band teams up with the Hot Club of San Francisco, the musical mercury is bound to soar. Devoted to the music of Gypsy-jazz guitarist/composer Django Reinhardt, the Hot Clubs (there are others around the world saluting Gypsy jazz, too) are named after Reinhardt’s fabled Quintette du Hot Club de France. There’s a special reason to heat things up this year: It’s the 100th anniversary of Reinhardt’s birth, and this celebratory concert presented by the University Musical Society should do Reinhardt proud. 8 p.m. Oct. 29. $18-$40. Michigan Theater, 603. E. Liberty, Ann Arbor, 764-2538, ums.org. 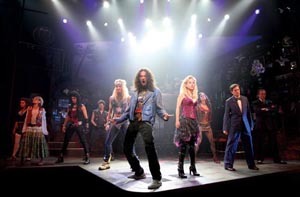 Add a dollop of mousse to make your big hair even bigger, slather on some neon makeup, and get ready for Rock of Ages. Straight from the ’80s, this five-time Tony-nominated musical is a throwback to the songs that defined a decade. Former American Idol contestant Constantine Maroulis plays Drew, an aspiring rocker guitarist from Michigan. When he meets Sherrie (Emily Padgett), a big-haired blonde, the two fall in love listening to their first Journey song. Bon Jovi, Pat Benatar, Poison, Styx, Twisted Sister, and others round out the ’80s lineup. Called “a seriously silly, absurdly enjoyable arena-rock musical” by The New York Times, this head-banging, hair-teasing story comes to Detroit during its first national tour. Nov. 9-21. $29-$105. Fisher Theatre, 3011 W. Grand Blvd., Detroit; 313-872-1000, broadwayindetroit.com. The Community House’s first Elmore Leonard Literary Arts and Film Festival honors its 85-year-old namesake. Leonard is a longtime Michigan resident whose writings have inspired nearly 30 films and TV movies and earned him the nickname “the Dickens of Detroit.” The pilot for the FX series Justified is based on his novella Fire in the Hole and will be shown as part of the festival on Nov. 12. The four-day event culminates in a gala at which Leonard’s achievements, as well as the first-place winners in the festival’s film and screenplay competitions and teen short story contest, will be recognized. Nov. 10-13. Free, $10 for Justified screening, $250-$500 for gala. The Community House, 380 S. Bates, Birmingham; 248-644-5832, elmoreleonardliteraryartsandfilmfestival.com. Even art experts can make mistakes, and the DIA exhibit Fakes, Forgeries and Mysteries, highlights those relatively few flubs that have been made over the years regarding artist attribution, authenticity, and value. The exhibit, which contains about 50 works of art, shows how the DIA continually re-examines art through technology and research. The show is divided into three sections. The first examines works for which the artists’ attribution has been altered by experts. Some pieces have been found to be copies or in the style of a famous artist. The second section highlights known forgeries, with explanations on how the DIA has arrived at that conclusion. In some cases, the real McCoy will be displayed next to the forgery. The last section contains mysteries that still confound the experts. There’s also a hands-on lab, where viewers can conduct their own art investigations. Nov. 21-April 10. $6-$12. 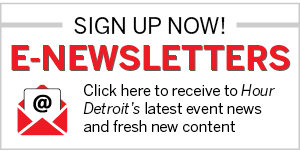 5200 Woodward, Detroit; 313-833-7900, dia.org. For decades, Glenn Gould’s 1955 recording of Bach’s Goldberg Variations was considered the gold standard of that taxing work. Other pianists recorded it, but none managed to generate much interest. Then, in 2007, New York pianist Simone Dinnerstein recorded the piece for Telarc, which garnered boatloads of accolades, and the CD rocketed to the top of the Billboard classical charts. Dinnerstein, whose emotional playing leans toward slow, measured tempos, has been compared to other fabled queens of the keyboard, such as Myra Hess and Wanda Landowska. The Chamber Music Society of Detroit brings Dinnerstein to town as she plays the complete Goldberg Variations at 8 p.m. on Dec. 4. $25-$75. Seligman Performing Arts Center on the campus of Country Day School, 22305 W. 13 Mile Rd., Beverly Hills; 248-855-6070. Pablo Picasso’s Blue Period, Rose Period, and his later Cubist paintings have all garnered a lot of attention. His prints and drawings haven’t received nearly as much notice, even though the Spanish artist was a master in these forms. He created more than 2,500 drawings and was involved in every step of the printmaking process, including techniques such as drypoint, etching, aquatint, lithography, and linocut. The exhibit Picasso explores his graphic works in a display of more than 40 examples taken from the artist’s long career. Dec. 4-Feb. 27. $5-$7. Flint Museum of Art, 1120 E. Kearsley, Flint; 810-234-1695, flintarts.org.